How to choose and apply highlighter? Highlighter is one of those cosmetics, each of us should have in her cosmetic bag. Thank to it make-up will be natural and full of radiant gloss. 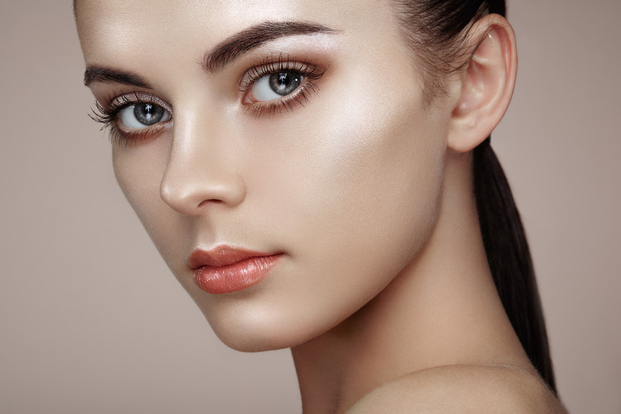 By skilfully applying highlighter you can contour face to make it more beautiful. Read below how you should choose and apply this product. If can be found in every drugstore, shop or the Internet auction. You can choose out of various formulas, shades and ingredients. There are three highlighter versions: a stick, liquid and powder. Stick highlighter is applied on the foundation, but before powder. Liquid highlighter should be gently tapped in with fingers or a sponge. It should be done carefully, so that it wouldn’t stand out too much from the foundation, but rather blend with it. Powder highlighter is the easiest in use. It is applied on already powdered face with help of soft brush. If you want for your make-up to look perfect, you need to know some rules of correct application. The most important thing is gradual blending cosmetic with the foundation. The skin must look fresh, radiant and natural. Do not use highlighter with brocade; it is trendy only on the chin and in your hair. If you suffer from imperfections, then highlighter will unfortunately make them only more noticeable. What highlighter colour should you choose? You can choose out of two colours: golden (matches warm skin type) and silver (matches cold skin type). You can match highlighter also with the colours you used for your make-up. In drugstores are also products with pink, violet and rainbow shades. If you use highlighter for the first time, choose neutral colours, that provide gentle effect. Highlighter can be applied many ways – all depends on the texture. To apply this product use fingers, a sponge or brushes. The last position should be chosen well for more precise application. Apply highlighter on the top of cheekbones, in the middle of the forehead, the bridge of the nose, Cupid’s bow and inner eyes’ corners. Next » How to take care of your complexion? Overcome fine lines and skin discolouration « Previous Are you sure that you know how to wash hands?